Enemies now break up into pieces and that’s very cool. But I’d also really want the player to collect something from this. May be not from every enemy and may be dependent on the enemy type, but something. There should be “casual” loot in regular combat, sort of, the archetypal equivalent of coins. Now, if enemies drop some sort of robot parts, what is the player going to do with them exactly? The player would also need to be able to convert these parts into something they can use, which likely implies the player is also a robot or at least has mechanical accessories. I have to be careful about feature creep though. 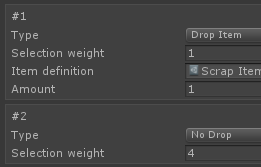 There are simple things I can add, like health or walking speed increase. But I could also scope this too much, need too many assets, require lots of UI, etc. I’ll just call it scrap for now implying multi-purpose reuse — it’s some sort of part, module, chip or something that robots can drop — doesn’t matter right now. They are not very noticeable at the moment. I will likely need a unique color scheme for them. 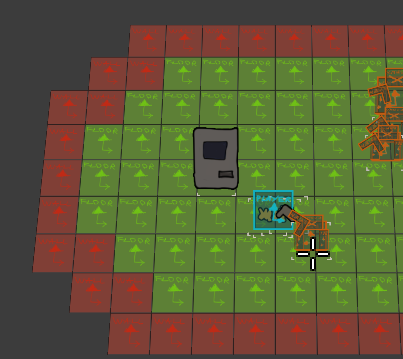 Of course, my enemy parts will (likely) not be orange rectangles either. Of course, this is greatly exaggerated here — only bosses would drop a lot of items. Regular enemies might drop one or two occasionally. The reward of these should feel somewhat proportional to the combat required. So the player needs to upgrade, but I don’t want them to do this just anywhere. This interrupts gameplay and is not a good enough “checkpoint”. But I also want to keep the player constantly playing — to be in the level at all times. So I don’t want to have upgrading between-level. Which means it will be in-level at certain key points. The question is what those key points are. The answer is likely just random “upgrade rooms”, since I cannot really predict reliable what the player’s path would be. Instead, I think I should add a room they really want to find to upgrade their stuff. A lot of my features are a whole lot of framework that need a whole lot more content. But stuff like stat upgrades practically generate content on the fly. I just need to keep up with making assets for every stat and parameter I can potentially upgrade. In other words, this is an easy, but impactful feature. Now, these have to appear only when I approach the upgrade station, so I need to wire everything through correctly to get that. I will likely talk about actual upgrades more at some point. I will likely also design a bunch that fit different gameplay styles and characters. But for now I have the framework.